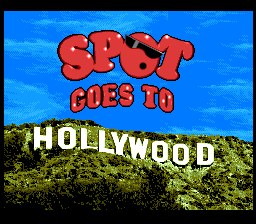 Spot Goes to Hollywood was an early 3D style platform. 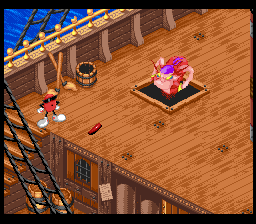 Although it came out on the Sega Genesis/Megadrive and 32-bit systems, the SNES version never made it out. Thanks to hydr0x for the Nintendo Fun Vision scan, Dangerboy from Game Rave for the PS1 screenshots, Retromags for the magazine scans and the Video Game History Foundation and finally Radar/Junoman for releasing the later prototype. This article is dedicated to the memory of Don Russell. He was a prolific collector who recently passed away after a lengthy illness. 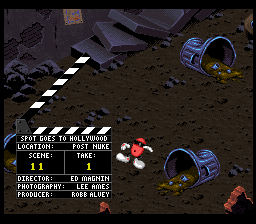 He was responsible for the preservation of many games, including the early prototype of Spot Goes to Hollywood. His illness left a burden to his family, please consider donating to this Gofundme page if you can. 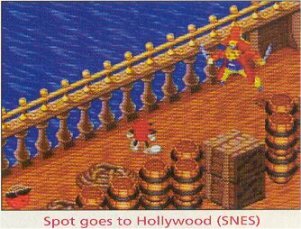 Spot Goes To Hollywood was a game that was supposed to come out when the transition from 16-bit to 32-bit systems was ongoing. In fact, from my research through EGM, it seems the 32-bit versions of this game were announced even before the 16-bit versions! 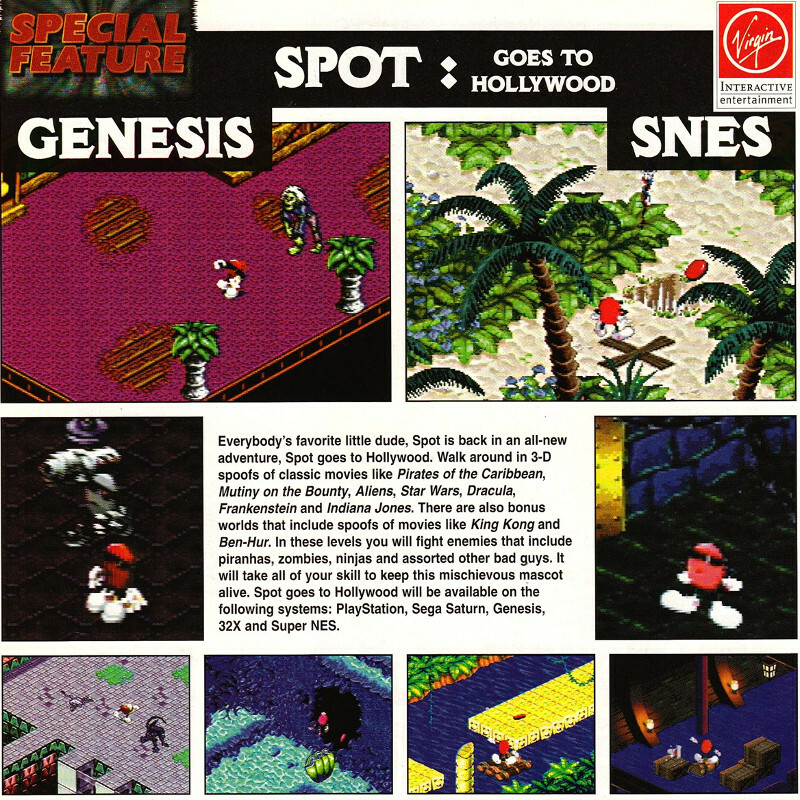 In the October 1995 issue of EGM, there was a preview of Spot, which shows some screenshots from both the Genesis and SNES versions of the game. 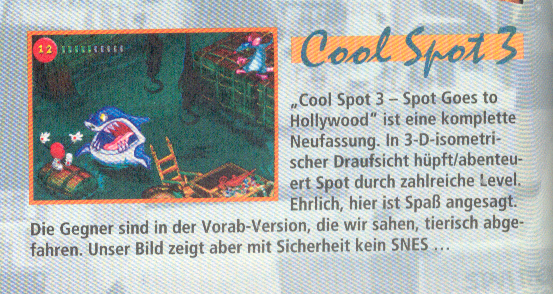 The game was also previewed in the German magazine, Nintendo Fun Vision vol. 17. They called it Cool Spot 3, even though there was only one Spot game before this. 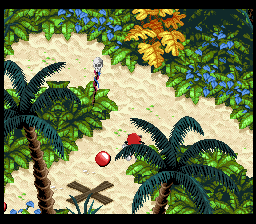 It is possible this screenshot is from the 32-bit version of the game. Here is another scan from hydr0x, although I am not sure exactly what the source is. 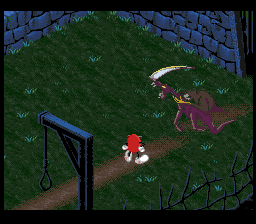 This particular scene is not in the early prototype, but it is in the later prototype. 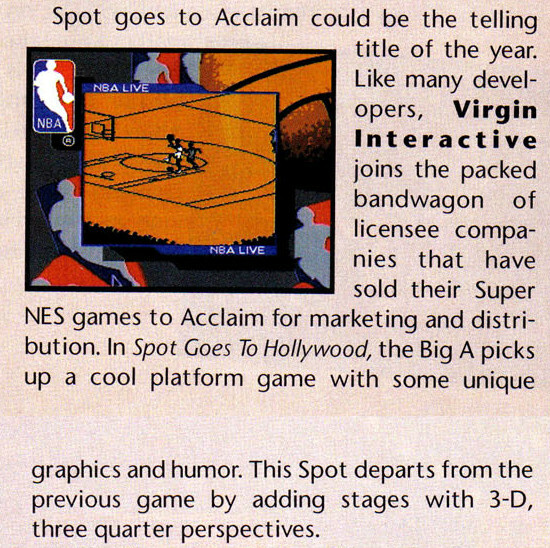 In the November 1995 issue of Nintendo Power, they state that Virgin had abandoned the system and sold the rights to publish Spot Goes to Hollywood to Acclaim. I played this Genesis version of this game a bit, and I found the gameplay to be a bit clunky, particularly because the enemies took a lot of hits to kill and it was not really possible to avoid their shots while killing them. 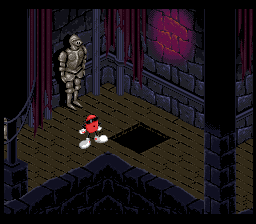 This 3D perspective works OK, but you could tell that there were still some lessons to be learned about how to deal with a 3D perspective (it was still some time before Super Mario RPG came out and did it much better). 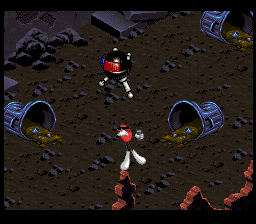 The contemporary reviews of the Genesis game complained of the same issues. This prototype shows the game in a very early state. The basic game engine appears to be complete, but there are few enemies and the collecting dots aspect to pass the level is not fully realized. There are many levels in the game, and it is possible to switch through them by pressing select. 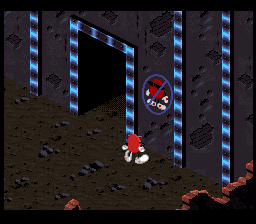 The game looks a lot different than the final Genesis version. It is more zoomed in, and Spot moves a lot faster. There are fewer animation frames, though. 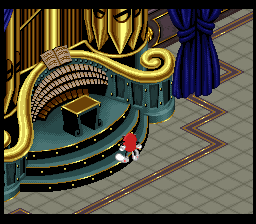 The music is pretty much the same as the Genesis version. 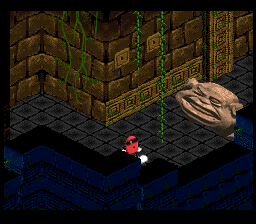 There are a handful of enemies, none of which appear in the first level of the Genesis game. This is not really much more than a tech demo. 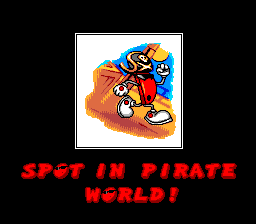 The title screen is also pretty much the same between the SNES prototype and the Genesis game. This pirate ship looks a lot different between versions. 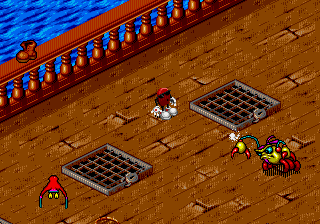 The crab enemy in the Genesis version appears like some sort of centipede creature in the SNES game. The PS1 game looks like a completely different game (perhaps not a surprise, since it was released about two years later). 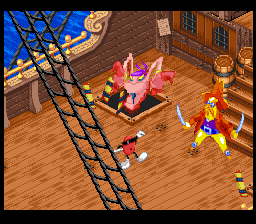 There are a variety of stage themes, including a pirate ship, a tropical paradise and a horror movie. 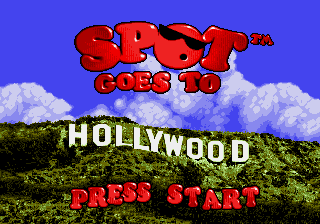 The next game was Spot Goes to Hollywood. That one I completely finished, including making last minute requested changes before submission to Nintendo. When I got back from a short well deserved vacation, I asked if it had been approved — “No, we decided not to submit it.” They did sell the Sega Genesis version, but didn’t think they could sell the minimums required for the Super Nintendo. I think they though they were saving money by cancelling it prior to approval, where I would earn a bonus. What they didn’t realize, I was entitled to the payment anyway, in the event they cancelled it. Of course, we never saw any royalties, just the money we billed them during the development cycle. A later prototype, but still not final, was revealed on a thread at Assembler Games in 2015 by Radar. Radar has graciously shared this prototype for preservation. 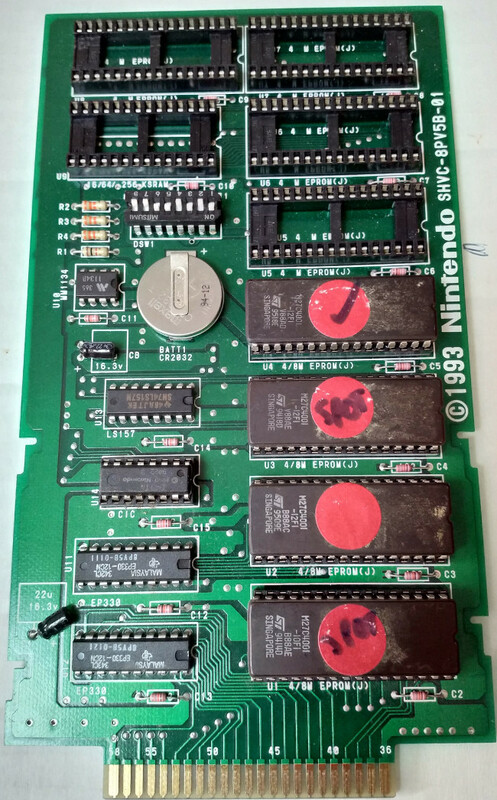 This prototype appears to be the same version that was used in the EGM preview at the top of this article. The game is in a much more complete state, but is still a long way to release. There were a number of places where I got stuck in the wall, and using keys froze the game. The enemies are programmed to move in a limited way, and although you can get hurt, they are not much of a challenge. Pressing select allows you to skip levels, making it easy to see the whole prototype. 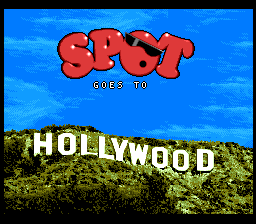 The controls and animation of Spot appear to be unchanged from the earlier prototype, and collecting spot icons has no functionality yet. 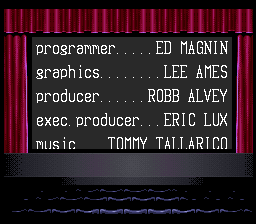 First thing that is noticeable is that they improved the font of the "goes to" on the title screen. This prototype adds an intro screen to some levels. 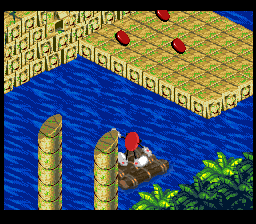 The later prototype changes up the level design in the boat level. The enemies also are more animated. 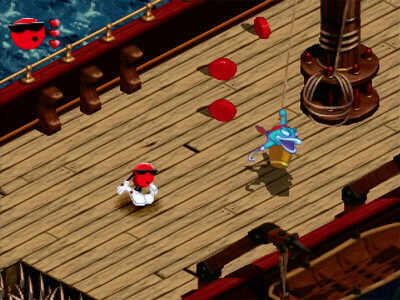 The later prototype removes the underwater pirate, instead having a more appropriate clam enemy. 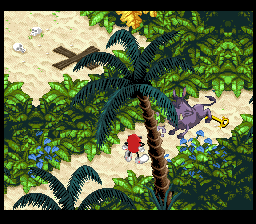 The tropical level is more complete, with a warthog enemy. 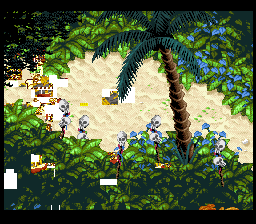 However, things get glitchy when you use a key (causing the game to freeze). 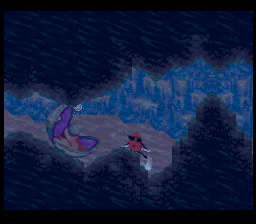 The Sci-Fi level is more fleshed out with enemies. The later prototype has quite a few more stages than the final. Some of them do not work very well due to the nature of the 3D platforming, and how precise you have to be with your movement. Inside of the ship, getting off the log is very touchy and it is easy to die. 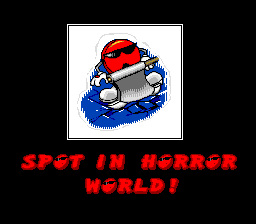 The horror stage is a lot more populated, but the enemies don't move much so they are easy to eliminate. Sci-fi level - no Spots allowed. 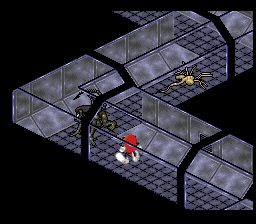 The level with blatant copies of Facehuggers and Aliens would probably not have made it to the final version of the game. 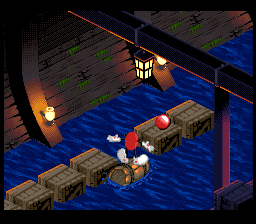 Adventure World, the raft works better than the log in the second level. 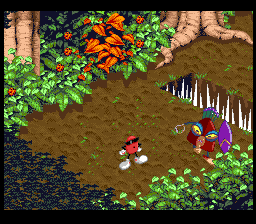 Second part of Adventure World, with masked enemies that go "ooga-booga". 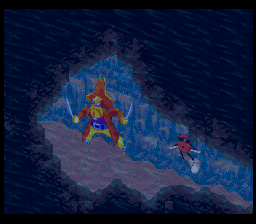 The final stage has some impressive looking enemies, that almost look like they were made with CGI. I did a stream of these prototypes, if you want to see them in action. Starts about 17:30 into this video.